Productivity is a big focus for my daily life. I think about it pretty much all the time and try to evaluate how I can get things done better and faster. Whether I am actually meeting all my targets all the time is another question. What I have found though is that routine really helps me become better at what I do. That might sound obvious, but not everyone believes in daily routine or have a clear way of achieving this. Write Goals for the day, tomorrow. Write / Reflect on Goals today and the future. So you start to add a whole bunch of cards into your Backlog, work on priortizing for the week and you're done! It feels great, you have a better idea of where things are at and a nice sense of accomplishment when you get cards to "Done". What usually happens from here, is that the Backlog gets bigger and bigger. Overtime, it's so large that you can't decide how to priortize it and give up or basically feel like you're never accomplishing enough. One idea that can help is putting a "cap" on the amount of cards you can put into the Backlog. It's totally up to you to stick to this cap but I do recommend something around 10-15 as anymore and it's likely not going to happen. The key part with a backlog is that you need to define what gets in here, a backlog isn't a place to put everything and should be your first point of filtering tasks which really aren't that important. 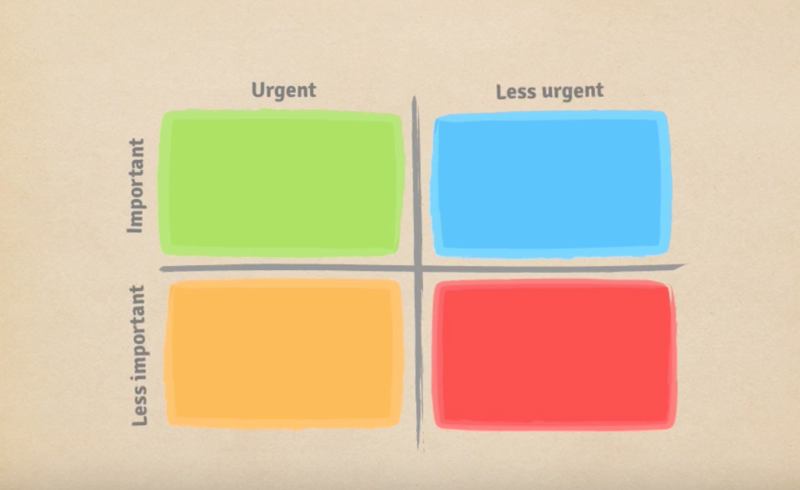 One system you can use to help priortizing is the Eisenhower Matrix. Generally speaking you'll then place the Urgent & Important first, then it's up to you to make the call on the Less Urgent & Important vs Urgent & Less Important ones. Less Urgent & Less Important tasks probably shouldn't even be in your backlog. You could put it in another column, such as a "Wishlist" but that usually means it's never going to happen. One thing to keep in mind is that if you have a "master" board for everything then it's likely the case your cards need to be pretty high level. For example, I usually have anywhere from 3-8 active clients at any time. If I put all their specific tasks as cards then my master board would not work. So I tend to keep 1 card per client with the most important task for that client. Then each client gets their own board if it's big enough. Todo = Sprint = Booked? The last point I want to cover is how you handle a "Todo" column. If you're just getting used to this then a todo might just be what you want to achieve today or soon. As you get more sophisticated or work on projects with teams the concept of a "Sprint" is likely to come up. A Sprint is just a predefined window of how long you plan on taking to do a set of tasks in a column. It is normally 1 to 2 weeks but really this depends on your work. The value in sprints is that it gives you a way to be consistent with how you organize work, reflect on what worked and didn't, and ultimately make improvements. This isn't about perfection, this system is meant to provide feedback for continual improvement. While I find "Sprints" very useful per project, I don't tend to use that kind of window for my own master board which organizes my entire business. Instead, I try to plan 1-3 months of tasks, usually 1 and then assign dates to each task in the column. I even called this column "Booked" instead of "Todo". For me this is a clear way of committing to a task and managing the flow. With Trello you can easily sort by Date as well so it's really easy to visualize this all. If you really want to take this a step further, install the plugin Planyway and you can integrate your google calendar with Trello and drag+drop tasks. Here's an image of what part of my Trello board looks like with the Planyway plugin installed. Using Trello with the Eisenhower matrix is a pretty powerful and easy process for managing work. If you are discipline you'll be amazed how easy it is to project deadlines and stay accountable. If you add in the Planyway calendar it will let you visualize everything and for me makes booking in client work much easier. Let me know if you have any ideas of your own that you use for staying productive!